Phase Four, a provider of electric radio frequency (RF) thrusters for in-space propulsion, have used The Aerospace Corporation to test their latest generation of RF thrusters. The Aerospace Corporation is a provider of independent technical and scientific research to national security space (NSS) programs. A thruster is a propulsive device used by spacecraft for station keeping, attitude control, in the reaction control system, or long-duration, low-thrust acceleration. RF thrusters use Radio Frequency technology to provide this control. 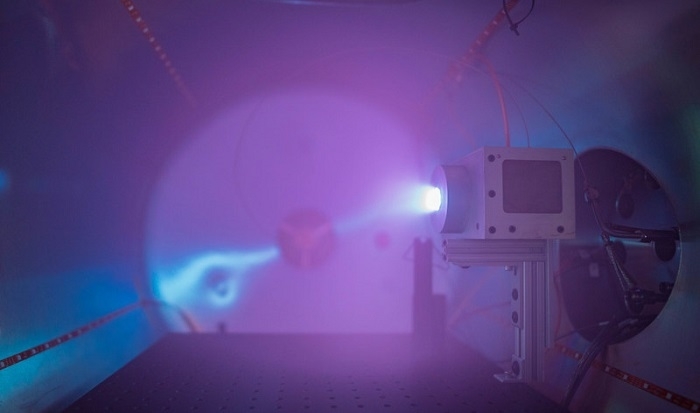 The testing found Phase Four's second generation of RF thrusters achieved their best performance to date, demonstrating performance on par with today's state-of-the-art Hall Effect Thrusters (HETs) and a 3000% efficiency increase over existing RF plasma thrusters. Phase Four's Chief Scientist, Dr. M. Umair Siddiqui revealed the full set of findings in his "Technology Testing" panel at the 34th Space Symposium in Colorado Springs, Colorado. The Phase Four CubeSat Class RF thruster tested by The Aerospace Corporation achieved the highest performing electrode-free RF engine data ever directly measured, producing up to 3.3 mN of thrust at 700 seconds specific impulse. The improvements were 6x greater than the proof-of-concept "RFT-0" and were a 30x improvement in specific impulse per Watt over any RF thruster ever directly tested on a thrust stand. Phase Four's RF thruster achieved this despite being less than 10% mass and volume of other systems. This is significant as the RF thruster is particularly easy to manufacture compared to incumbents, making it a strong candidate for a mass-produced engine for satellite mega-constellations. Based in El Segundo, California, Phase Four is enabling the exponential growth of satellite constellations by solving the satellite's costliest problem, the propulsion system. The company's electrode-less RF thruster is the smallest plasma propulsion system available today, and can be scaled for use from CubeSats to small sats to school bus-sized satellites. By eliminating the most common failure points in incumbent technologies - electrodes, high-voltage electronics, and complex fabrication - Phase Four has built a system that is reliable and offers high-performance with baked-in manufacturability. Designed with tomorrow's satellites and constellations in mind, the P4 RF thruster brings small sats the same performance levels of large satellites, in a simpler form factor. Click here to learn more about Phase Four.